There are a variety of ways to contain the shavings or clean the hair up easily. This guide is about cleaning up the sink after shaving. My DH, per my request, attempts to clean up his daily whiskers following his morning shave. However, as we all know, facial hair is very difficult to clean up as it sticks to everything. What looks like a "sufficient" job to him doesn't come close to my personal standards. What do you do about these short, tough hairs that tend to go everywhere? I'm looking for some clever advice that DH will adhere to daily. Is there a way to keep them from going everywhere or is there a special cleaning procedure that rounds them up quickly after the fact? Thanks in advance for all of the advice! You're a great group! It may sound odd but I use a lint roller or masking tape. It picks up small things like whiskers just as it picks up hair and lint from sweaters. It works great. My husband and son drape a towel over the sink when they are shaving. The towel catches the whiskers then just pick up the towel and dispose in the trash can or outside (maybe the birds can use the hair for nest building!). My advice would be to tell him to solve the problem himself but there better be NO MORE hairs on the sink. If he can earn a living he can figure it out. I have to agree with Deeli, sorry, "Mom." My DH tends to lay a piece of cardboard he keeps for that purpose over our sink. He doesn't shave nearly as often as he used to, but when he does, this method works. He also hates to shave in a dirty sink, so he always scrubs it first - even if it's recently been scrubbed. Bonus for me, lol! Actually, at the date of this post, there's a unique idea i saw on Kickstarter. It's called a Bro Towel and it's a filter that covers the sink bowl and catches the hair. Once you're done you just close up the filter and throw it in the trash - hair and all. How do you keep your sink clean after your men shave their faces? 1 - Wait until after the last male in the family has shaved and then go in there to clean up after them. Use a moistened (at a different sink, I've used the bath taps) paper towel to mop up the hair then disinfect with your preferred bathroom disinfectant. 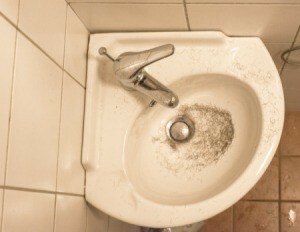 2 - (preferred method) Teach the guys that a real man cleans up the sink after himself! Show him/them how to do it, make sure the supplies are easy for him/them to find. Be sure to point out to the lads that only an inconsiderate oaf leaves the bathroom a mess; also remind them that you're actually NOT the bathroom fairy and it is their responsibility to tidy up after themselves. A man who doesn't have the common decency to clean the sink after he shaves is a man who either has no respect for the other people in the house or is a man whose mum babied him. Ick.